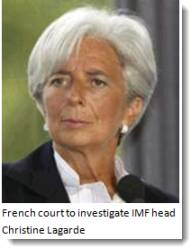 I reviewed the candidates for IMF head on May 23, "Old Europe" backs French finance minister Lagarde for IMF head. The traditional choice of a European to head IMF was challenged by candidates from Mexico and Asia. The United States ultimately tilted toward the French finance minister who is now in office. So there you have it. The IMF chose Lagarde when there was a legal cloud over her head. Had the court decided that no further investigation was warranted, that choice would have been justified. The fact that there was sufficient evidence to proceed to an investigation shows the IMF had reckless disregard for judicial, political and financial realities of Lagarde's status at the time. IMF also proceeded to risk IMF's standing and reputation, severely tattered at this point, once again and clearly made the wrong bet. We can expect those who made the decision to receive medals or some other award from an international body soon.